If you’re familiar with San Diego, you’ve likely discovered the laid-back Polynesian-inspired delights (and Mai Tais!) of one of my favorite restaurants, the Bali Hai on Shelter Island, a great dock-and-dine spot. 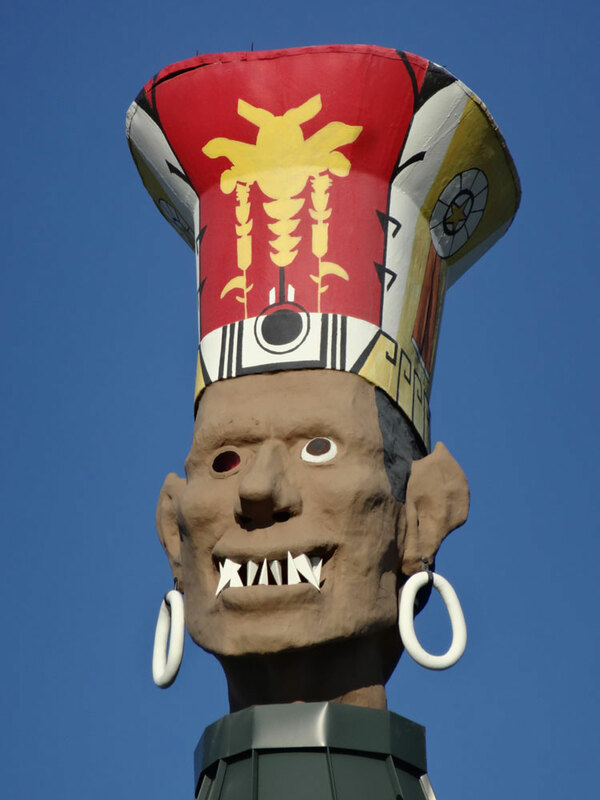 The legendary tikis, Mr. Bali Hai, their official greeter, and the rooftop Goof, whose single red eye doubles as an aircraft-warning beacon, always make me smile. And have you browsed the Bali Hai’s fascinating collection of Polynesian art and artifacts, outside the main dining room? At first glance, the Bali Hai, which opened in 1955, might seem a charming period piece, despite its stylish 2010 remodel. But delve a little deeper around the waterfront communities and you’ll discover the Bali Hai is one of the most prominent survivors of the best collection of well-designed Tiki Modern or Polynesian Pop-style architecture in the country, with most located along Shelter Island and Mission Bay. Little remains nationwide. This whimsical, sometimes wacky, style of architecture arose post-World War II as a nostalgic fantasy of the South Pacific, along with tropical drinks, puu-puu platters and luaus. Its full flowering arrived in the 1950s and ’60s, surrounding Hawaii’s 1959 entry into the union and the musical South Pacific’s debut, just as lushly landscaped Shelter Island and Mission Bay were developed and promoted to tourists as “a little bit of Hawaii” on the mainland. Each time I visit Shelter Island I see more distinctive Tiki Modern elements built into the hotels and low-rise commercial buildings. I’m always amused by the carved wooden tiki heads serving as bollards at the entrance to the island’s main parking lot and topping fence posts surrounding Shelter Island Boatyard. Similar tiki heads and outrigger-style beams adorn bougainvillea-covered arbors shading the island’s benches. Yet the real surviving architectural treasures, many visible from the water, are buildings exhibiting the trademark dark wood shingles, pointed porte-cocheres, A-frame rooflines, outrigger-style supports and often black lava rock. Among my favorite Shelter Island tiki-style structures is Humphreys Half Moon Inn & Suites, with its towering triangular porte-cochere and A-frame secondary entrances, including its concert hall. Although most of the tiki totems once scattered through its interior courtyard are gone, it retains its Polynesian flavor and tropical landscaping. Other noteworthy Shelter Island Drive tiki-style buildings include Crow’s Nest and Stan Miller yacht brokers, Custom Marine Electronics, the Island Palms Hotel and, another of my favorites because it’s so unexpected, Pearson’s Fuel Dock and Deli with its tiki A-frame roof. And don’t miss Trader Mort’s Liquors, with its outdoor tiki totem and array of tiki mugs sold inside. For more Polynesian-inspired architecture, be sure to ride or dinghy over to Paradise Point Resort on Vacation Island in Mission Bay (call ahead for dockage). Tour the tropically landscaped grounds, noting its freestanding lobby with tiki torches, gift shop, convention center, and restaurant. The whimsically-designed observation tower overlooks a duck-filled lagoon, offering dazzling views of Mission Bay. Continuing around Mission Bay to Sail Bay, beach your dinghy at the Catamaran Resort Hotel, boasting Polynesian-inspired architecture amid lush plantings and waterfowl-filled lagoons. Tiki Modern elements include an A-framed porte-cochere ushering guests into a lobby featuring a lavish waterfall flowing over black lava rock. Nearby, resident parrots chatter on their perches. Don’t miss their fine collection of Polynesian art and excellent new Oceana Coastal Kitchen restaurant. Before going on a tiki tour, download Save Our Heritage Organization’s (SOHO) handy guide, available free at sohosandiego.org/tourbooklets/TikiTour.pdf. Since publication several buildings have lost their original tiki design during remodels. Next time you’re in the area, join me in appreciating San Diego’s unique architectural treasure.